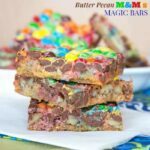 A fun mocktail or dessert the kids will love for Valentine's Day, St. Patrick's Day, or a special birthday. 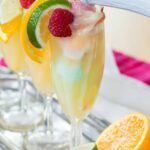 Rainbow sherbet floats made with Martinelli’s Sparkling Cider are a fun mocktail or dessert the kids will love for Valentine’s Day or a fun way to celebrate a gluten free St. Patrick’s Day! They can even make a birthday more festive. 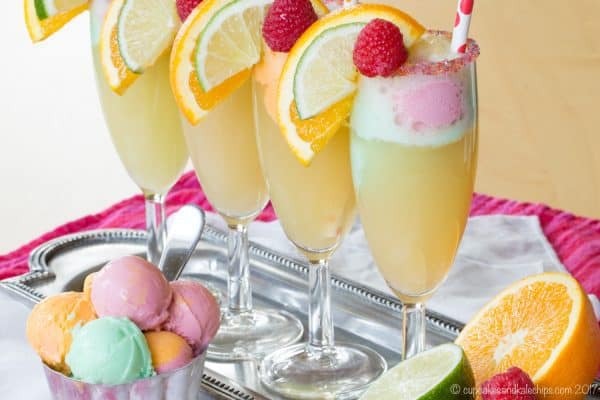 With a few fun touches, add some color and bubbles to any special day with Sparkling Cider Rainbow Sherbet Floats. Disclaimer: This recipe was developed through a sponsored partnership with Martinelli’s. As always, all opinions are my own. I don’t do cute food. I see strawberries turned into Santa Claus and white chocolate melted into a puddle then adorned with eyes and noses to look like a melted snowman for Christmas. Pretzel sticks are decorated like mummies and chocolate chips are transformed into wee bitty spiders crawling all over a plate of cookies for Halloween. Pink hearts are found baked into the middle of a cake and heck, even grapes and tomatoes and olives are turned into hearts for Valentine’s Day. And everything from fudge to fruit platters are turned into rainbows for St. Patrick’s Day. I’m just not that creative. Sure, I can wield a cookie cutter with the best of them, and I have been known to cut a banana into quarters and give it raisin eyes to make a banana ghost. And one time I even made pancakes of varying shapes and sizes, then assembled them to look like the Easter bunny. But you’re more likely to see me tossing some spinach in the blender along with a frozen banana and some mint extract to make a minty green smoothie for St. Patrick’s Day. 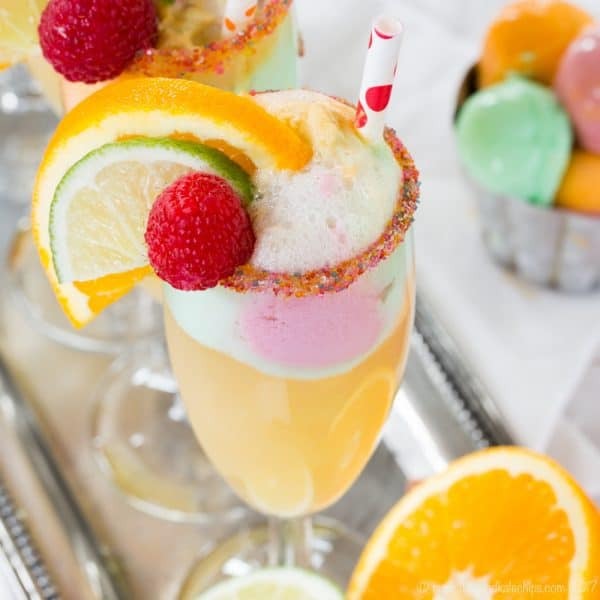 Sparkling Cider Rainbow Sherbet Floats will brighten up any day with a colorful and tasty treat! This is a fun mocktail that can be as simple or as fancy as you like. For a bit of extra sparkle, before you make your floats, just dip the rim of your glasses or flutes in honey or corn syrup and roll it around in some rainbow decorator sugar, or even little nonpareil sprinkles will work. Have some orange, lime and raspberry slices, or really any fruit that matches the flavors of your sherbet or sorbet. Then get ready to have some fun. 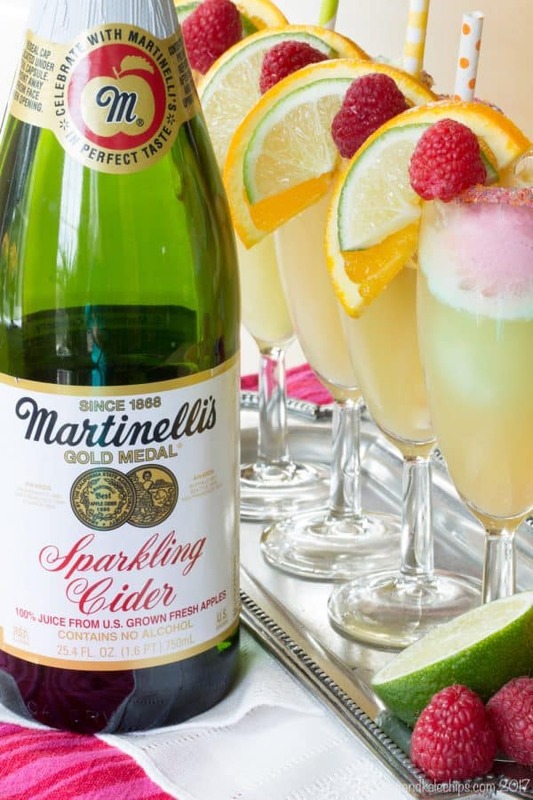 Martinelli’s Sparkling Cider and Juices make everyday a special day, and turn those special days and holidays into an event to remember. When I shared my Sparkling Cider Apple Chutney recipe, I told you how Martinelli’s have been a part of celebrations for me and my family throughout my life, and I have carried on that tradition with my boys. 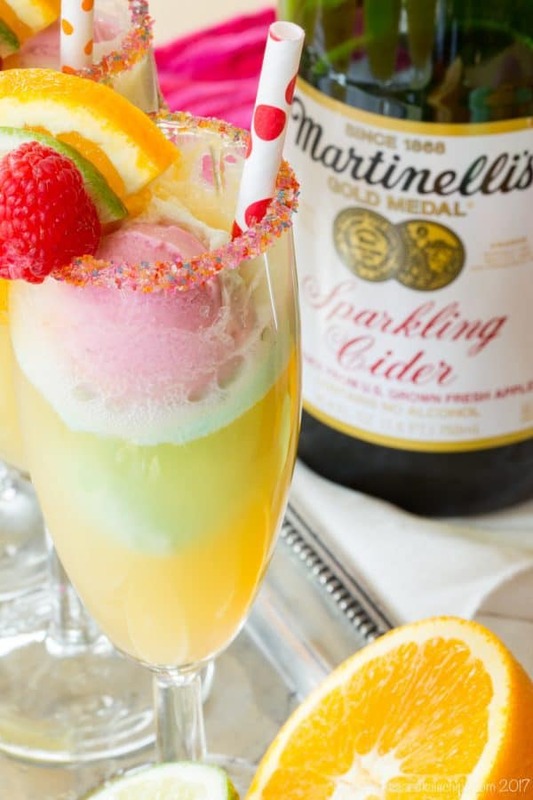 Sparkling Cider Rainbow Sherbet Floats are sure to be a new way to continue our tradition of celebrating with Martinelli’s. I hope that they are part of your Valentine’s Day, St. Patrick’s Day, Mother’s Day, birthday, or any other special day this spring and summer too. 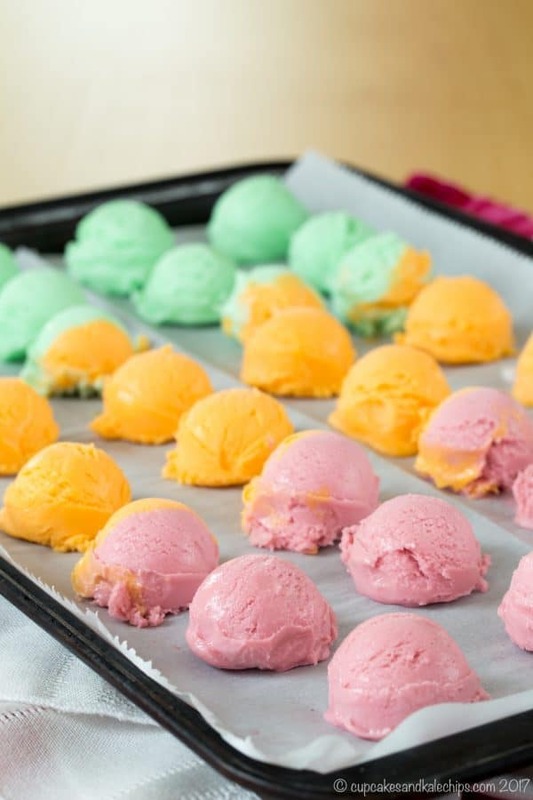 Using a small cookie scoop, melon baller, or spoon, scoop balls of the different flavors of sherbet or sorbet onto the baking sheet. Place the sheet with the sherbet balls in the freezer for an hour or two. Pour a small amount of honey or corn syrup into a small bowl. Dip the rim of your glasses or champagne flutes or glasses in the honey or syrup and then into the rainbow sugar or nonpareils. Set aside until ready to serve. When ready to serve, fill each flute or glass about halfway with Martinelli's Sparkling Cider or Sparkling Apple-Pear Juice, using a funnel if needed to keep the sugared rim intact. 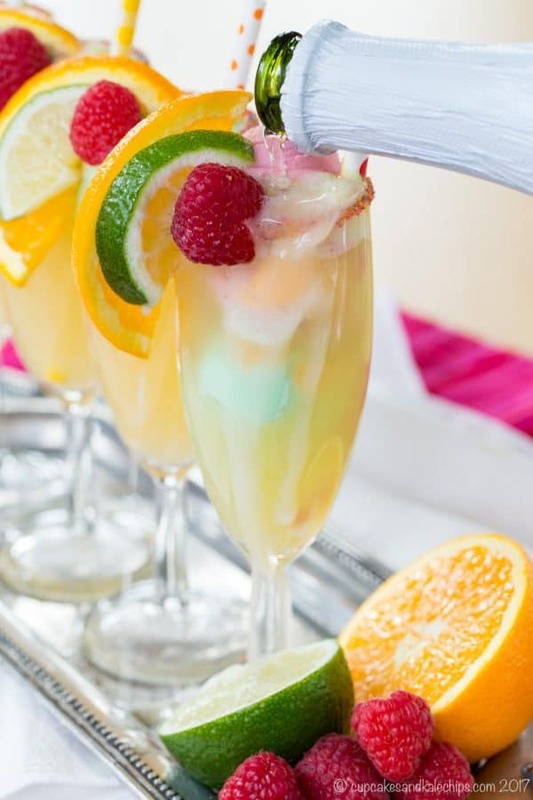 Add 3-5 sherbet balls of varying colors to the glasses, then fill to the top with additional Sparkling Cider or Juice. Add orange and lime slices and raspberries (or other fruit) to the rim for garnish. 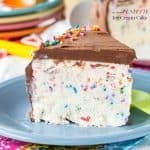 Oh my goodness, this looks heavenly! My kids would love these for sure!!! I love how bright and colorful these fun drinks are!!!! When I was a child my dad would put a roast and vegies in the oven Sunday mornings for dinner after church. Always that roast in the oven and we were starved by the time we got home! He would often give use a scoop of orange sherbet in a juice glass with apple juice poured over it. No bubbly apple juice yet that we knew of in the dark ages. He would also do vanilla ice cream with grape juice. Yummy fun memory. What a special memory, Kathy. Thank you for sharing it with me! Love this! So fun and colorful. I’ll be making these for the next kid sleepover! These floats are SO fun!!!!! As a kid we did this for picnics! But, we just used strawberry sherbet…need to try rainbow! It’s so cute! The color is great, too. This will be a nice treat for my daughter on her birthday’s party. Coincidentally, it is on Valentines Day. Thank you for your very detailed recipe. 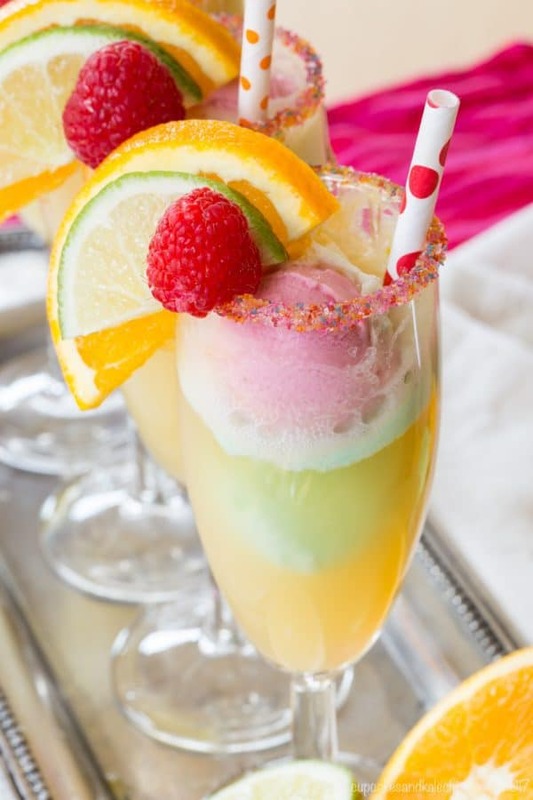 You don’t make cute food but your Sparkling Cider Rainbow Sherbet Floats is so amazing!!!! I want to surprise my kid with it. Thanks you very much!!! Thank you so much, Kareen!